The Bingham Wind Project, which has drawn both opposition and support from environmental groups around the state, was permitted by the state on Monday. BINGHAM — While several Maine environmental groups have embraced a proposed 62-turbine wind farm here, some still continue to oppose the project and could continue efforts to stop it, despite newly won approval for the wind farm from the Maine Department of Environmental Protection. 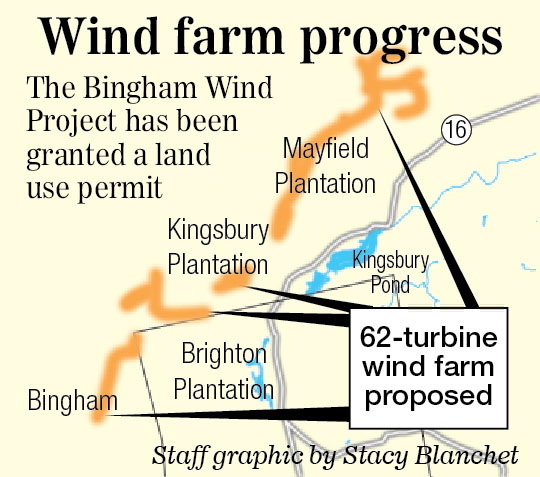 The Bingham Wind Project, which is proposed by Boston-based First Wind, was granted a land use permit by the department on Monday, one of the final steps needed before construction can start. Meanwhile, three environmental advocacy groups — the Sierra Club, Conservation Law Foundation and Environment Maine — announced their support for the project Tuesday in a joint news release. If built, the Bingham project would be the largest wind farm in the state. Work could start sometime this winter, project officials say. Other activist groups, such as Friends of Maine’s Mountains and the Citizens Task Force on Wind Energy, continue to oppose the project. The groups can move to delay and eventually block the project by filing an appeal either with the Maine Supreme Judicial Court or the department’s Board of Environmental Protection. Friends of Maine Mountains will appeal the decision to award the project a permit if the group can raise enough money, said Chris O’Neil, president of the Weld-based group, which opposes wind energy. The group’s top points of opposition are the financial risk of investing in wind energy and lack of a plan for dismemberment of wind farms should they become obsolete or the equipment becomes outdated. The wind farm’s construction is subject to a number of conditions set down by the DEP in its decision, including that the company must provide evidence of financial ability to construct, operate and maintain the wind farm, which is estimated to cost about $398 million. According to the 55-page decision, which details the process of review and conditions of the permit, the department has been told about concerns about First Wind’s capacity to finance the project in light of a recent Maine Supreme Judicial Court decision that tossed out a financial partnership between First Wind and Emera, a Nova Scotia-based energy company. The court eventually vacated the ruling after the Maine Public Utilities Commission adopted additional conditions on the partnership intended to prevent the companies from monopolizing wind power and granted its approval. If all goes well, he said, the company hopes to start construction on the project this winter. The company still is awaiting a permit from the Army Corps of Engineers, which also is needed before construction can start. In 2011, the group unsuccessfully appealed the construction of the Saddleback Ridge Wind Project, a 12-turbine wind farm in Carthage that is now under construction by the Patriot Renewables group. In February, the Appalachian Mountain Club, the Maine Appalachian Trail Club and the Appalachian Trail Conservancy dropped opposition to the Bingham project after Blue Sky West, a subsidiary of First Wind, donated $700,000 to the creation of a conservation easement along the Appalachian Trail. A portion of the trail falls within eight miles of the project, the threshold the department uses to evaluate scenic impact, but because there were no “designated scenic viewpoints along this portion of the trail … the applicants concluded that the project should not have an unreasonable adverse effect on the scenic character of the Appalachian Trail,” according to the decision. In addition, the DEP said in its decision that the department received a number of comments throughout the review process from members of the public concerned with the scenic impact in areas not designated as having state or national significance.